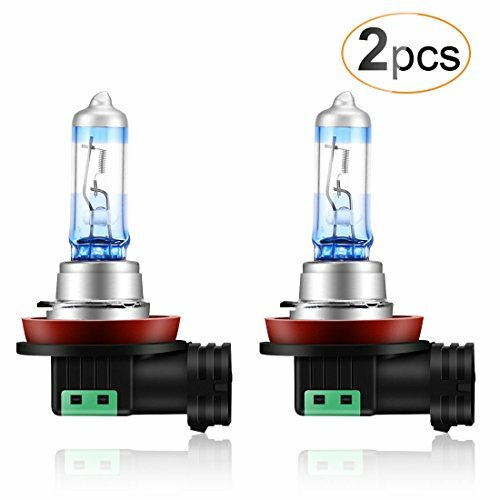 AGPTEK H11 Halogen Xenon Headlight Bulbs, 2 Pack by AGPTEK at Kart Racing Network. MPN: APH11S-US. Hurry! Limited time offer. Offer valid only while supplies last. Description:- Boost your vision with AGPTEK headlight! This new version H11 headlights are designed to maximize the brightness from halogen bulbs. - Boost your vision with AGPTEK headlight! This new version H11 headlights are designed to maximize the brightness from halogen bulbs. They are your perfect choice if you are looking for a product that emits ultra-white light. - Increase driving safety, see potential obstacle sooner! These upgrade-version headlight bulbs are filled with up to 70% xenon, offering up to 110% more light, and it's 30% whiter compared to a standard halogen bulb for better visibility and longer reaction time. - Totally street legal and high quality! Our product are ECE and DOT certified, rest assured that the headlight it's fully legal on the driveway. High-precision blue coating makes it applicable in both high and low beam. Special tube-making process ensures stable performance and durability. Advanced Lighting Technology: The bulb adopts special filament, high transmittance glass with skilled treatment process, and fill in 70% xenon to make it a durable lighting bulb with the best lighting effect. Super Bright: The 55W headlight bulb emits 1350LM white light with 5000K color temperature, 50% brighter than standard halogen lamp. Versatile: These bulbs can be used for motorcycle or car based on the model of PGJ19-2. ECE Certified: The bulb passed the certification of ECE. Safer and more reliable.